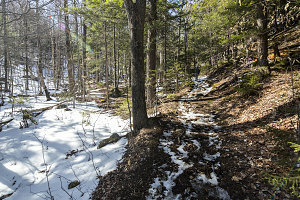 This is the story of a very little climb up a very little Adirondack peak - one that had fallen beneath my attention for many years - Snow Mountain. 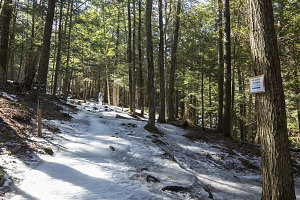 Snow is a small 2400-foot peak that rises up out of Keene Valley. Owing to its low height relative to just about every other nearby peak, I never gave it much thought. 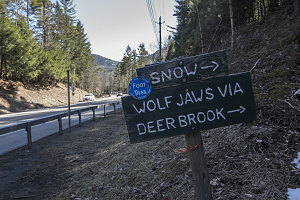 I did remember reading a glowing online trip report many years earlier, and half-dismissed that with the assumption that the reviewers were perhaps first-timers in the Adirondacks, easily dazzled by just about anything they summitted. Thirty minutes of driving brought us from Catamount's trailhead to Keene Valley. 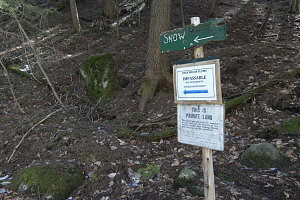 Not far south of the actual town of Keene Valley is the trailhead for Snow, right along Route 73. 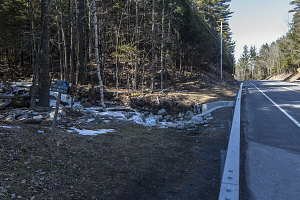 Although the trailhead is right along a busy highway, it is actually not that obvious. 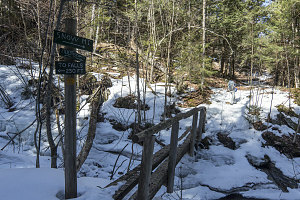 There is no large trailhead sign - just a very small dark green sign with white lettering on the western side of the road, just north of the bridge over the Ausable River. There's a bit of wide shoulder to park on, but nothing more. Since we had just come off of a hike, we were pretty much already suited-up and ready to go, so we were off in just a few minutes. We hopped the highway railing and made our way past the aforementioned small green sign (which also includes a line for the Wolf Jaws, which can also be reached via this trailhead). 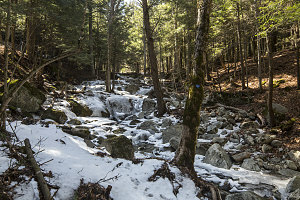 The first part of the trail to Snow Mountain closely follows the banks of Deer Brook - a relatively steep and cascade-filled watercourse that apparently is one of the scenic attractions of the Snow Mountain trail. 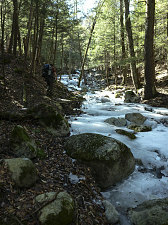 The initial lower stretch that we followed was quite iced up, and we didn't get much view of cascades. Very shortly - perhaps no more than five minutes' worth of walking, we arrived at a small dirt road and concrete bridge that crossed our path. A sign greeted us at this road, indicating the option of a "high water" route off to the left. 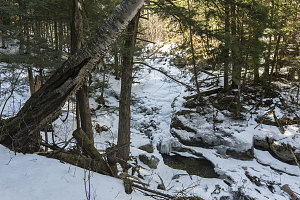 It also had a more recent addition stating that the trail continuing up along the banks of Deer Brook was closed due to storm damage, and that all hikers should use the high water route. There was no indication of how long this detour sign had been in place nor any indication of when the main trail might re-open. Not having any better beta, we followed the directions and started off on the high water trail. The high water trail turned out to be nothing more than a steep dirt road that serviced some residences sprinkled over the hillside. 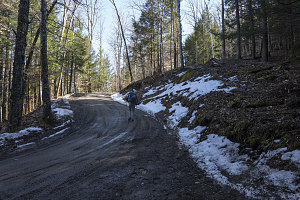 We walked up the road's steep and winding route for perhaps three-quarters of a kilometer (half a mile at most) before coming to an upper trailhead (with plenty of no hiker parking signs - you cannot drive your car to here and start your hike), where we returned to an actual hiking path. A hundred or so yards beyond this we came to the upper junction of the high water route, and rejoined the main trail to Snow Mountain. The snow mountain trail continued uphill, now with a fair bit of ice underfoot (not quite enough to convince us to change to microspikes, though). The trail itself is clearly some old unused carriage road, and its tread is very wide - you could easily hike two or even three abreast. We continued upwards in the shadowy hollow of the Deer Brook drainage for a few more minutes. 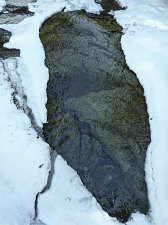 The trail then turned right and crossed Deer Brook on a wooden footbridge. 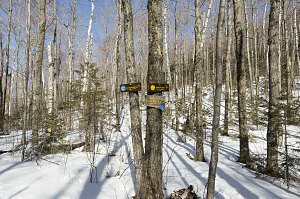 There was a junction here to a short spur trail that led uphill to some falls on Deer Brook. 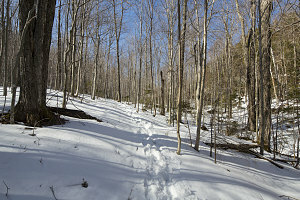 Continuing upwards at a moderate grade, the trail switchbacked once before settling into a steady straight-line climb towards the col between Snow Mountain and its much higher immediate neighbor, Hedgehog Mountain. The snow depth increased as we climbed, but it never got much more than half-ankle deep. 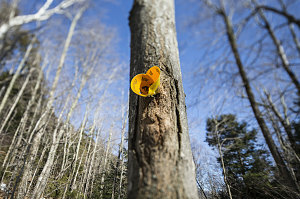 The weather was perfect - a sunny, clear, calm and somewhat mild early spring day. The forest as we neared the col was almost entirely deciduous, and therefore quite open feeling owing to the leafless, still-dormant trees. 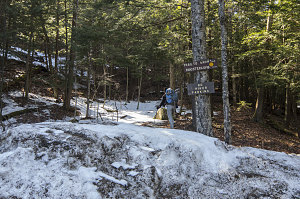 Forty-five minutes after setting out from the car, we arrived at the Hedgehog-Snow col, where a trail junction clearly marked the spur trail that led off east up the final slopes to Snow Mountain's summit. The elevation at the col is around 2150 feet, meaning that there is only about 250 or so more vertical before one arrives at Snow's very moderate summit altitude.